I am really pleased to say that Monu Professional Skin care has added me to their Preview Panel! This means they will be forwarding me sneaky peaks of any new products to test and review before they are released to the general public! Yay! Needless to say I am super excited and those who know me will be able to tell you how much energy I put into skin care! I believe that good make up needs to start from great skin and since I have not been blessed with incredible skin I’ve had to try and change that with good skin products! I have been using a selection of MONU Skin care products in the past few weeks and I can honestly say that my sensitive skin seems to bode well witsh it gentle formulas. 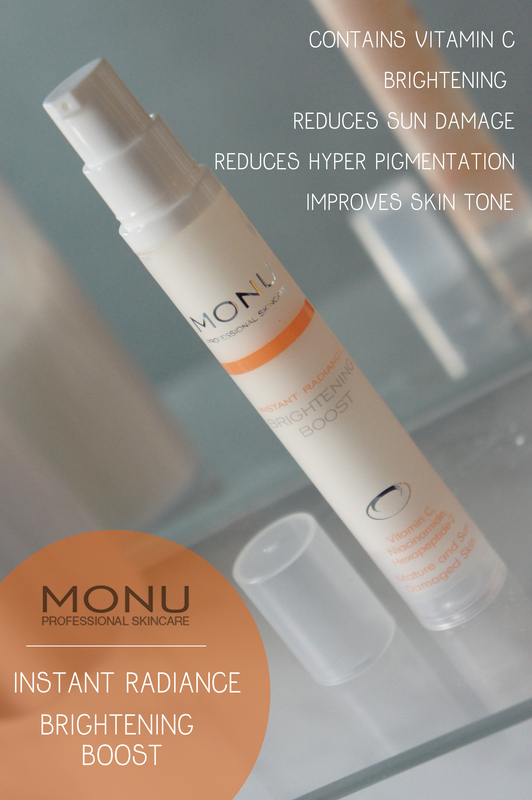 Today I wanted to show you all a sneaky peak of Monu’s NEW Brightening Boost from their Instant Radiance Range. The product is said to be good for reducing hyper pigmentation and age spots but is also recommended to people who generally lacks vitality and radiance in their complexions… that’s me! Now I haven’t used the serum for long enough yet to really see any of the above effects, but watch this space! On first impressions though the serum gives a lovely ‘awakening’ effect after use because of the ultra hydrating, serum texture! It really gives tired skin a moisture boost. Once the product has seeped into the skin (which is a matter of seconds) it leaves the skin looking matte and not shiny! Whoop! The below photo shows the product slighty rubbed in, I haven’t blended it completely so that you can see for yourselves the texture of this lightweight texture. I will be continuing to use this product for the next month to see if there are any visible changes to my skin, I’ve used it for a few days now and have not experienced any irritation, so that’s a good sign for all the sensitive ladies out there! 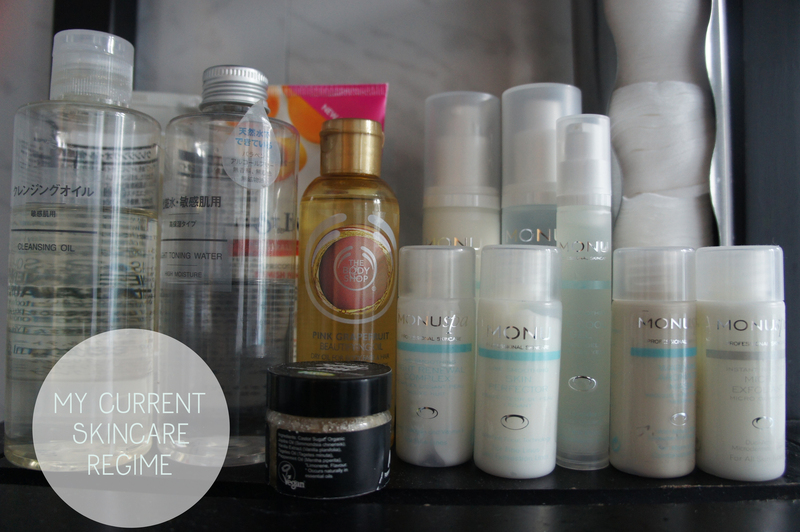 I love adding new things to my skin care routine, partly because I get bored and because whenever something new and interesting comes out I love to try them! Whoa thats a LOT of products lol! But I don’t use ALL of them everyday I just like a change now and then to mix it up a bit! hehe! Anyway the Brightening Boost will be available to buy from 18th October 2012 for £19.95 so look out for it if you fancy giving it a go! Tags: Brightening Boost, Instant Radiance, Monu Professional Skin Care, Serum, Skin Brightening. Bookmark the permalink. Previous post ← Cosmo Blog Awards High!